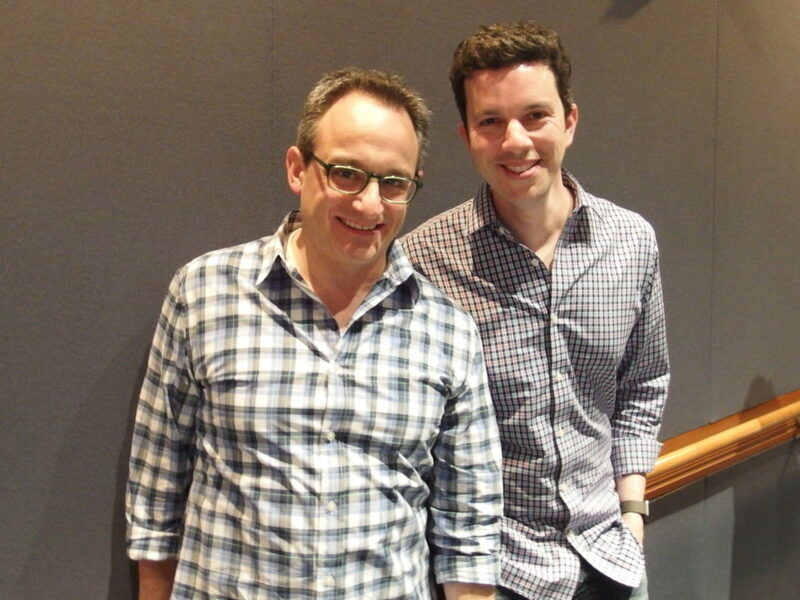 Once Upon a Time co-creator Eddy Kitsis is obsessed with Emma Swann’s mortality. At least, fans of the hit ABC TV series can be forgiven if they come to this conclusion based on a number of his comments on Tuesday, May 2nd at the Disney Studio. 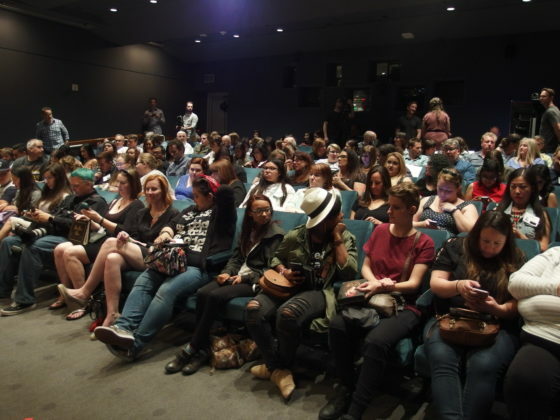 The comments came during a lively panel discussion following a screening of Sunday night’s musical episode “The Song in Your Heart,” sponsored by Disney social media site OhMyDisney for an audience of some of OUAT’s most devoted fans. Offering a complete episode five days before the official airdate does invite spoilers (though we’ll keep it spoiler free here). 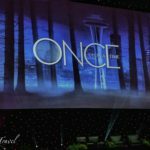 In general, the episode unfolds with parallel stories, one in the present dealing with complications in the impending wedding of Emma and Hook, and the other in the pre-Storybrooke Enchanted Forest, dealing with complications in the impending wedding of Snow White and Charming. The common bond between the stories is a curse, originally cast in the Enchanted Forest, which causes residents to spontaneously break out in song. 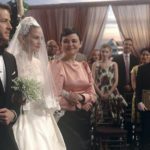 In present day, Storybrooke Regina and her sister Zelena work together to break the spell in time to save the wedding, but it is Henry who is able to figure out what needs to be done. There is a wedding. There is a curse. Otherwise, it would not be an episode of Once Upon a Time. Following Wednesday night’s screening, the audience was treated to a panel discussion featuring questions that had been submitted in advance. 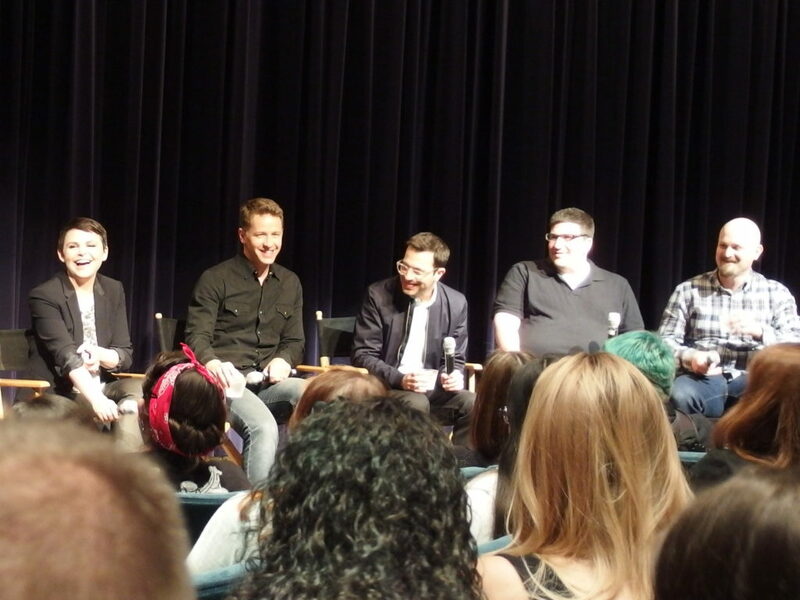 Participating in the panel were co-creators Adam Horowitz and Eddy Kitsis, writer David Goodman, and cast members Ginnifer Goodwin (Snow White) and Josh Dallas (Charming). The moderator, from OhMyDisney, began the discussion with an appropriate question: What was each panelist’s favorite moment in the episode? Horowitz immediately replied that his favorite moment was watching it live with an audience of fans. 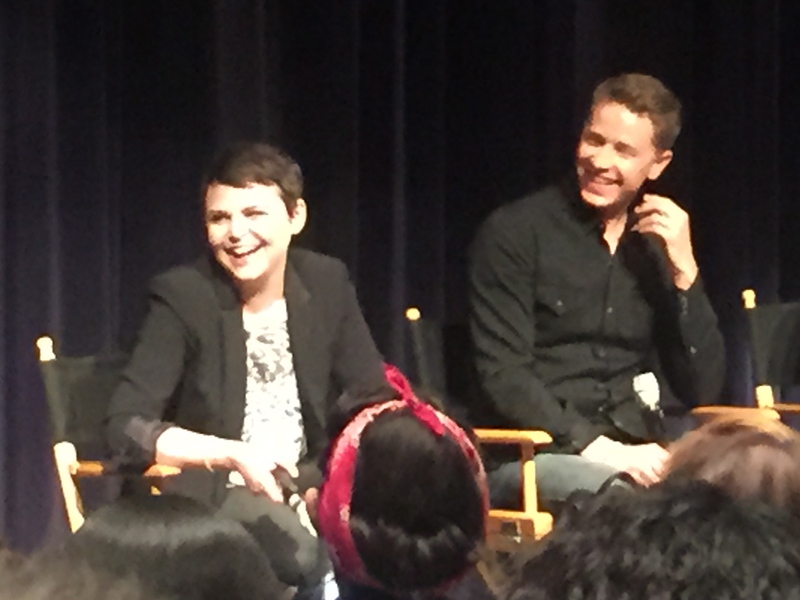 Josh Dallas predictably said that his favorite moment was when Snow and Charming first burst into song. 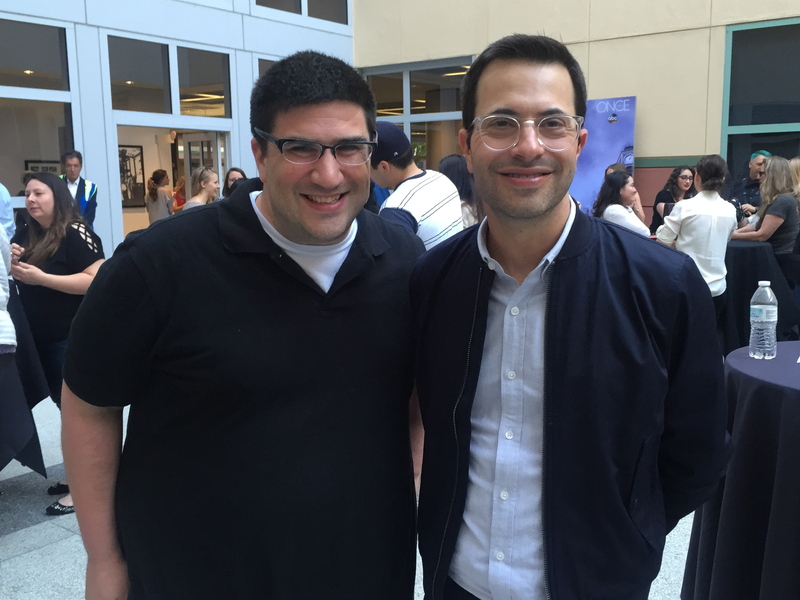 This led Kitsis to say that his favorite moment was each of the amazing songs. 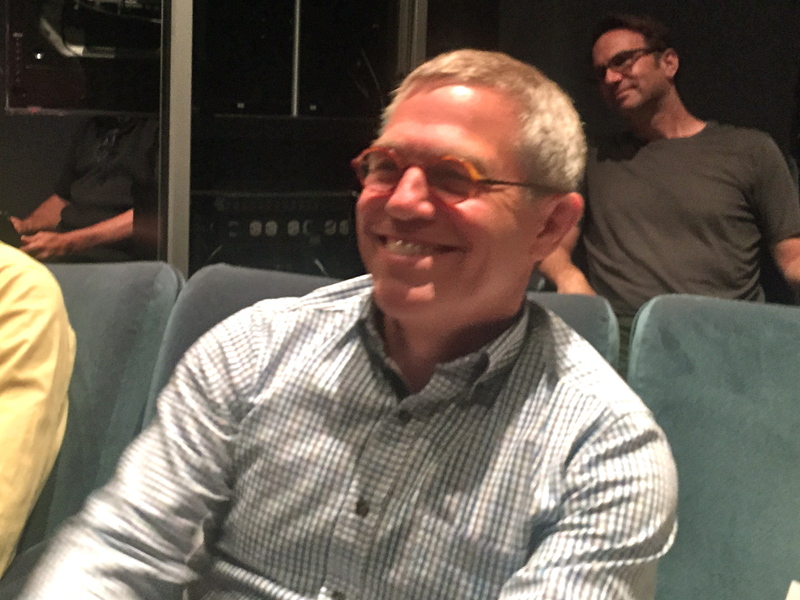 He pointed out the songwriters, Alan Zachary and Michael Weiner in the audience, and then singled out the episode’s director, Ron Underwood, also in attendance that night. 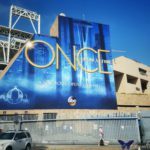 Asked if it had been planned to have the wedding take place during a musical episode, the creators laughed and said that they found out about it when the writers told them. 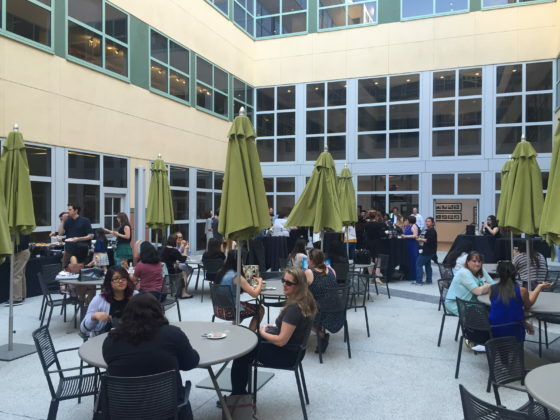 When asked what kind of planning process they had for Once Upon a Time, Horowitz asked in mock dismay, “Our what?” Kitsis chimed in, “I think we need one.” He went on to explain that there was actually a “mini-camp” held between seasons, in which the creators and writers worked out the general direction of each season, broken down by episode. As an example, he stated that they knew that in the next episode Emma and Hook would marry and that Emma would die. In the shocked moment of silence that followed, he loudly added, “Oops! That’s next week! She may not die… but she may. She probably doesn’t die. It would be such a spoiler if she did.” His convoluted explanation brought tears of laughter to Ginnifer Goodwin, and the audience realized they were being led on. For his part, Kitsis went on to point out that ABC had not yet renewed the show, so if ever there was a time to kill her off it was now. The joke about Emma’s imminent mortality became a running gag for the rest of the evening. Questions covered a range of topics, dealing mostly with the episode itself, Once Upon a Time in general, and a few for individuals. Some answers seemed predictable, as when the panel was asked to name their favorite Disney character or film. Horowitz promptly responded “Snow White,” saying that while the answer may have seemed phony, it was the first movie he could remember seeing. For Kitsis it was Alice in Wonderland, “Just because I like it.” Writer Goodman offered Maleficent. Goodwin had to choose Zootopia (she was one of the stars of the film), but added that she was also partial to Winnie the Pooh: “He was my first boyfriend.” She recalled that Dallas read the Winnie the Pooh stories to her belly while she was carrying their first child. And she pointed out the odd coincidence that only after purchasing their house, they learned it had previously belonged to Sterling Holloway, the memorable voice actor in Disney’s original Pooh films. There was general consensus when asked about Disney theme park attractions. Pirates of the Caribbean was a universal favorite. To that Dallas added Indiana Jones and the Temple of the Forbidden Eye; Goodwin added the Haunted Mansion; and Kitsis added Star Tours. He also sang the praises of the Buena Vista Commissary, a favorite of his at Walt Disney World. 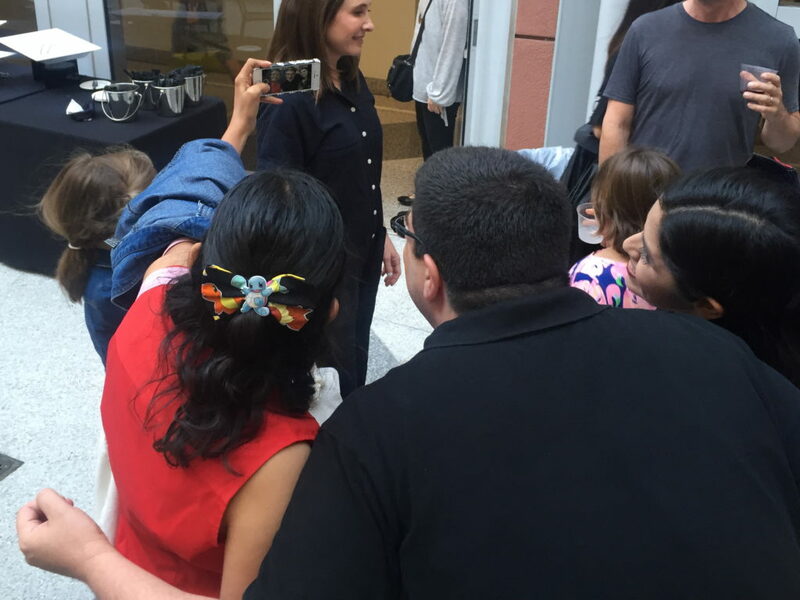 Of course, with a room full of Once Upon a Time fans, the questions inevitably turned to the series itself. One of two questions dealt with which character the panelists (non-performing) most identified with. Underwood immediately offered Prince Charming, real name Prince David, which was also his name. Horowitz said it was an impossible question to answer, as he identified with each character in a different way. Kitsis was succinct: “Henry.” After a short pause he added the Evil Queen (“Sometimes.”), Regina (“More than I care to admit.”) and Emma (“But she DIES. Just her soul.”). The second question dealt with the most shocking plot twist in the course of the series. Kitsis mischievously shouted out, “Emma’s death! Or not.” On a serious note, he stated that for him it was the revelation of who Henry’s real mother was. He explained that part of the twist was that they had originally plotted the series to culminate with that revelation at the end of the fifth season, but that it was moved up to the end of the first. For Goodwin, it was the discovery that Red Riding Hood was herself the wolf. She recalled hearing about it in her kitchen during a visit with the director, Ron Underwood, coincidentally the director of that evening’s musical episode. She also mentioned the twist ending to the Rumpelstilskin/Beast story line. Goodwin and Dallas, married since 2014 and the parents of two, charmed the audience with their responses. Asked what they liked best about playing Snow White and Charming. Goodwin stated that she loved working with her favorite actor and best friend. Dallas mused aloud, “It’s been… it’s been… what?” Goodwin interjected “Magical!” Dallas agreed that it was, indeed, magical to work with her. Their responses to a question about which other OUAT character they would like to play brought one surprise. Dallas chose Rumpelstilskin, saying that Robert Carlisle got to cover such a wide range in the role. Goodwin’s reply was the surprise. She chose Henry. Not only would it mean that she would not have to wear a wig, but for her it would be the closest she could get to play Harry Potter. In discussing the episode itself, Dallas and Goodwin said their favorite musical moment was their first song and dance number together, “Powerful Magic.” Goodwin revealed that she was terrified of singing, and never thought it would happen. Dallas interjected, “Does she not have a great voice?” Goodwin said that she fell in love with the duet, and admitted, “I actually did have fun. I will never say that again!” Dallas lauded the songwriters, Zachary and Weiner, whose enthusiasm and love of the show itself made the process so great. Goodwin complimented them on creating songs that never stopped the show, but carried the plot forward. The creative team was asked which characters they were most excited to create songs for. As Dallas leaned forward expectantly, the agreement was: Zelena. Noting the disapproval from the acting portion of the panel, Horowitz said it was another impossible question: “Who’s your favorite child?” He pointed out that they created as many songs as they could for as many characters as possible, and that all seven had been written just since the first meetings in December. The entire panel got to tackle the question of which song was the most challenging. Dallas intoned, “Stairway to heaven.” As the audience laughed he pointed out that it wasn’t even in the show. Goodwin said she thought it would be the musical “duel” when Snow White and Charming confront the Evil Queen. Horowitz said for him that it was easy, as he just got to watch them. He turned the question to the two songwriters in the audience. They said their greatest challenge was the song for the wedding that ends the episode. Originally they composed a brighter piece that was more pop oriented and festive. But as they realized they had to cover both a wedding and the impending curse that hangs over the entire episode, they decided on something more romantic and adaptable. “The Song in Your Heart” airs Sunday, May 4th on ABC. It will be followed by a two-part episode on Sunday, May 14th.